This lady has only been doing hair wrapping for a few months! Upon becoming friends on facebook, I knew that we had to feature her on Wrapunzel. I’ll stop blabbering and let her speak for herself; Meet… Hannah! I am quite honoured to be asked to be a Wrap Star. I am quite new at covering my hair…only a few months! I am a nice Jewish girl, and I grew up in Montreal in what I guess would be considered a culturally Jewish environment. I am married to the most amazing man, who isn’t Jewish. I have been on a journey which includes becoming more observant. My amazing husband is completely supportive of this, and is actively raising our son to also be Jewishly observant. I have been keeping Shabbat for several years, and our kitchen is mostly Kosher (I only use Kosher food, but we still have to buy separate meat and dairy dishes…in time…). My husband, son and I went to Israel this past May, and I was incredibly inspired by all the hair coverings. I have always liked the idea of married women covering their hair. To me it seemed to be such a special Mitzvah. 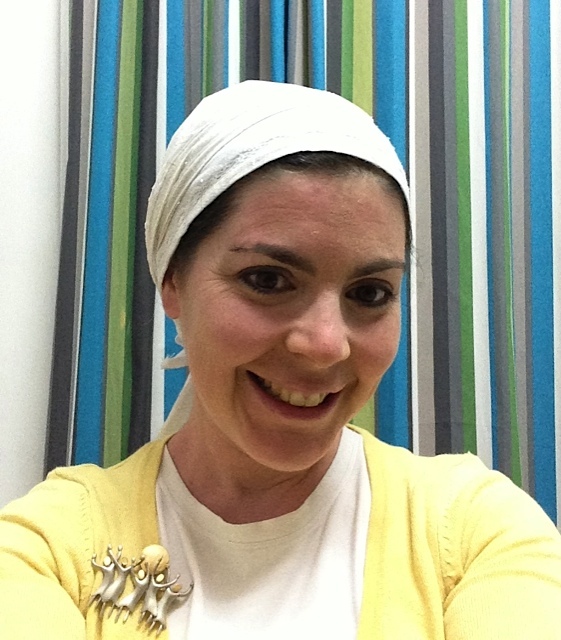 I started covering part of my hair while in Israel, and then by the time we got home, I decided to take on this Mitzvah full time. My collection of tichels started with the five I bought in Israel: 3 sinar (apron) tichels and 2 square tichels. Like most families, we are on a tight budget, and I realized quickly that buying tichels can get pricey! I had a thought…how many people buy scarves they don’t wear then give them away to Value Village? I love buying the second hand scarves because they are so different than the ones in the stores here. They are also much much cheaper, less than five dollars a scarf. I bought a few scarves and realized…I have no idea how to tie them! I guess that is why I liked the sinar tichels so much. I discovered Andrea and Wrapunzel and I LOVE her website. Andrea shows so many beautiful wraps and shows how easy they are to do! I buy scarves that I like, but some fabrics are not always predictable once they are on your head. Andrea has helped me troubleshoot my tichel issues. I’m still learning to tie my tichels and some days even a simple wrap takes me ten minutes because I can’t get things to sit on my head properly. My friends have asked me how many scarves I have…and I really don’t have that many (I think)…and I keep thinking my answer should be “not enough”. I have a few favourite wrap accessories…my grip band and my colorful bobby pins. I found a package of bobby pins in the dollar store in a rainbow of colours. I like using those either because they are camouflaged in the scarf or they add a little flair. I have a couple of fabric flower clips and I would love to find more pins and hair bands to help accessorize my tichels. I also found a donut bun thing (what is it called??) that I find helps fill my wraps better. Of course after I bought it, I discovered Andrea’s sock trick to do the same thing! Some other things about me…I used race mountain bike… while I was doing my Masters degree, my friend and I had a vegetarian/animal rights radio show…I used to be painfully afraid to speak in public and now that’s all I want to do! (too many years of keeping quiet??) In 2009 I went on the Jewish Women’s Renaissance Project (JWRP) trip to Israel and it was AMAZING! I would love to make Aliyah with my family one day (my parents live in Israel now). Thanks Andrea for all you share and having me as a Wrap Star! And thank YOU Hannah for being our Lady Wrap Star! Wasn’t that refreshing? I think it’s so incredible to have so many women from different backgrounds sharing their stories and love for hair wrapping. Questions/comments/encouragement for Hannah? Post below! Hannah, you’re so beautiful! I love your wrapping pictures. For only wrapping such a short time, it looks like you’re doing a lovely job. So nice to get to know a little more about you! Thank you! Chava. Awesome, and lovely pictures for sure!! Its great to see others that cover and their stories! Where on earth did you get the one with music notes?!?!?!!!! I found it at Value Village is a chain of second hand stores here, I seem to find a lot more interesting scarves at second hand stores. Hannah, I love your story! I, too have been becoming more observant through the years and I ALSO am married to a Non-Jew. I am so happy to hear he is supportive of your practice. Mine is also supportive but I DO find that sometimes there is a disconnect? How are you able to share with him and still CONNECT? 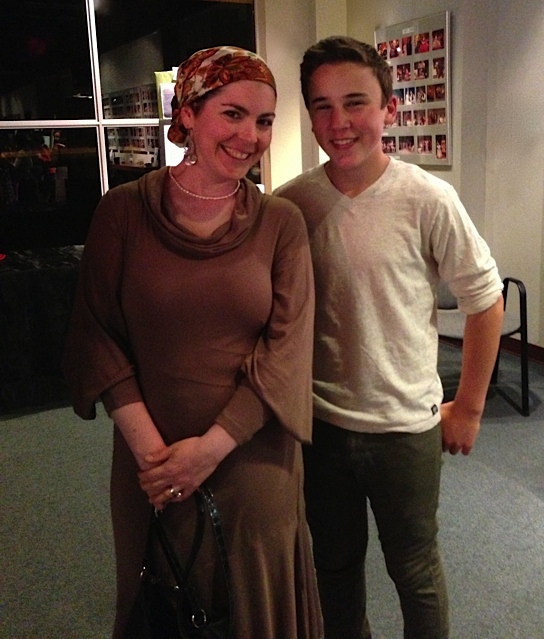 I don’t cover my hair full time yet – (Shabbos and almost any event outside of work) but I don’t feel he is connected or understands when I have tichels on. Any advice you have, I would greatly appreciate. Believe me, I know that all mitvot are between me and Hashem but I would also like to be more connected with my husband too. It’s been a little tough for me. Anyway, thanks for sharing your story! Your tichels look great!! There is a lot of give and take for our relationship. He is supportive and joins for Shabbat dinners or lectures, but I have to let him do his own thing on Shabbat sometimes (like get together with his buddies). I know sometimes he does feel overwhelmed and that’s when I let him have his space. We are also blessed with a very understanding Rabbi and Rebbetzin who also want my husband to feel welcome and comfortable. (Funny enough at Shabbat dinners, the Rebbetzin always wants to seat my husband near the other less observant Jewish husbands to show how easy it all is lol). Happy to answer questions.